Cincinnati, Ohio — Ten years of community-wide collaboration have paid off for students in Cincinnati and Northern Kentucky. After a decade of bringing together cross-sector partners to improve academic outcomes from cradle to career, nearly 80 percent of key indicators of student success are improving and there is clear evidence that the community is aligning resources around solutions that work. These local trends have earned StrivePartnership the “Proof Point” designation from StriveTogether, the organization announced today at its national convening. StrivePartnership started in 2006 when a group of leaders from various sectors throughout the Cincinnati area came together with a common goal: to improve academic success in the urban core. More than 300 cross-sector representatives joined the partnership, including school district superintendents, early-childhood educators, nonprofit practitioners, business leaders, community and corporate funders, city officials and university presidents. The Cincinnati Preschool Promise (CPP) mobilized community members, Cincinnati Public Schools (CPS) and the business community around the share goal for two years of quality preschool for all children in the city. Now, CPS, in partnership with CPP, is pursuing a November 2016 levy to both significantly expand access to preschool and strengthen the entire public school system so every child has a strong start and future. Public and private funders are investing in Every Child Capital, a first-in-the-nation venture philanthropy fund focused on scaling proven early literacy interventions. To date, ECC has attracted more than $4 million in funding. Partners are aligning their work with the overall goals of the partnership. For example, Cincinnati Children’s Hospital adopted third-grade reading as a measure of overall child health in its most recent board-approved strategic plan, and the United Way of Greater Cincinnati aligned its Bold Goals in Education to the partnership’s shared outcomes and its Bold Plays are in sync with the partnership’s priorities. 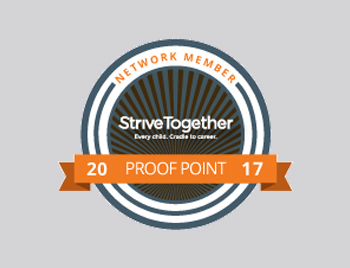 The StriveTogether Cradle to Career Network, which represents 68 communities across 32 states, is working toward the common result of the success of every child from cradle to career. StriveTogether has developed a method to assess the effectiveness of collective impact partnerships, helping communities stay focused on results and sustain impact over time. A community in the Cradle to Career Network will be designated as a Proof Point community when 60 percent of indicators across six cradle-to-career outcomes are maintained or improved year after year. Additionally, community leaders across sectors must demonstrate evidence of changing how systems work in four key areas: shared community vision, evidence-based decision-making, collaborative action and investment and sustainability.